Stocks continued their impressive first quarter recovery into early March but then finally ran into some selling late in the month as corporate buybacks took a breather and investors started to worry more about weak global economic data and a deteriorating earnings outlook. But looking back over the past three months, the single most important driver of the surprisingly sharp recovery off the ‘Christmas Eve lows’ had to be the reversal in forecasts from the U.S. Federal Reserve from a continuing period of interest rate increases to a ‘wait and see’ approach that emphasized ‘patience’ in looking at the data. The prior expectation of two or three further rate increases in 2019 suddenly switched to a consensus view of no more rate cuts, with a growing belief that the next move could actually be a cut in interest rates. For a stock market that had become addicted to the ‘zero interest rate’ world that existed from 2010 to 2018, the potential that we could be headed back to such an environment emboldened the ‘risk off’ investment crowd. The fact that global economic growth was missing all expectations was sloughed off as only a short term worry since the Fed once again had the stock market’s ‘back covered’ and would do “whatever was necessary” to keep growth intact. Even the breakdown of sector performance over the quarter reflected this renewed bullishness on interest rates. Defensive and interest sensitive sectors such as utilities, REITs, telecom and high growth stocks (i.e FAANGs) were the big winners of the quarter, while the economically-sensitive financials, industrials and basic materials sectors were the laggards. Helping the bullish cause was the fact that other global central bankers echoed the U.S. Fed comments. Euro’s ECB head Mario Draghi could not have been more accommodative in the press conference following the regular ECB quarterly meeting. The Bank of Canada also joined the club of ‘dovish central bankers’ with a much more muted view on their economic growth and interest rate prognostications. In a fairly short statement, the Bank of Canada abruptly took an unexpected turn that has the market thinking of the modest prospect of a rate cut by the end of this year. This new cautiousness from central bankers was well supported though. The euro zone’s central bank slashed its growth forecast for 2019 to 1.1% from an earlier forecast of 1.7% made in December. Mario Draghi said that there had been a “sizable moderation in economic expansion in the fourth quarter that has extended into the current year. Since the organization last downgraded many of its forecasts in November, little has gone right for the world’s biggest economies. Weakness in the euro area and China are proving more persistent, trade growth has slowed sharply and uncertainty over Brexit has continued. If anything, things could get worse as risks pile up, including further trade barriers, a disorderly U.K. withdrawal from the EU or financial vulnerabilities from elevated debt. Italy’s economy may see its first full-year contraction since 2013. OECD commented that “the global expansion continues to lose momentum and growth outcomes could be weaker still if downside risks materialize or interact. The persistence of uncertainties related to geopolitical factors, the threat of protectionism and vulnerabilities in emerging markets appears to be leaving marks on economic sentiment.” The 19-member region has been overshadowed by political developments in Italy, which entered a technical recession at the end of 2018; and in the U.K., where its departure from the EU has yet to be finalized. There are also concerns about a potential slowdown in the Chinese economy, given the EU’s reliance on exports to that country. Recent manufacturing data have also indicated weaker activity, especially in Germany — the traditional growth engine of the region. Adding to the global slowdown woes, Japan’s government downgraded its assessment of the economy in March for the first time in three years, blaming a bruising U.S.-China trade war for slumping exports and industrial output. The Cabinet Office, which helps coordinate government policy, said the economy is in gradual recovery, but exports and output are showing signs of weakness. 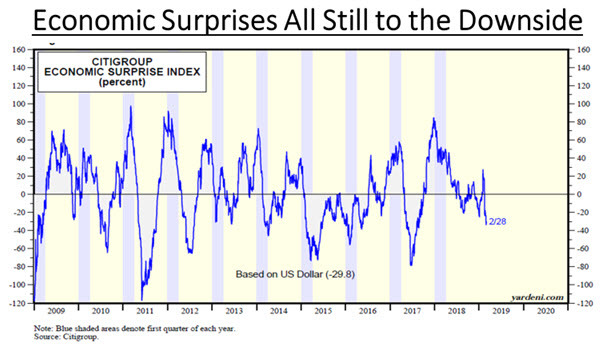 The bottom line, as shown below in the Citigroup Economic Surprise Index, is that most of the economic indicators have been worse than expected since early 2018. What’s interesting to us is that, even in the U.S., which is viewed is being the last ballast of economic strength in the global economy, the leading indicators are pointing to slowing activity even if the key data points have not broken down. The chart below shows the composite indicator for ‘soft data’ (i.e. mostly consumer and business surveys covering confidence/spending intentions/etc.) has been trending lower for almost two years as growth in these indicators slows down. But the hard data (i.e. retail sales/industrial production/trade) has yet to turn decisively lower. 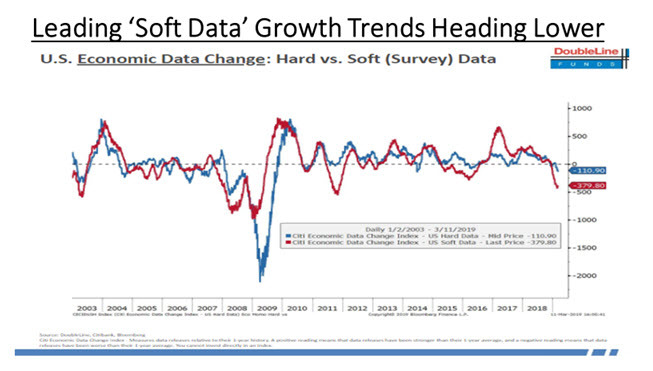 However, this has been the pattern in most economic cycles as the red line (soft data growth) tends to turn down before the blue line (hard data growth). But despite the weak data, investors have been ‘puddle jumping’ the news and whole-heartedly buying into a second half recovery. Since the December 24th close the S&P 500 has rallied almost 20% and is currently trading more than 16 times the 2019 earnings estimate. One of the reasons investors are looking past poor economic data is that they feel that a U.S./China trade deal is imminent, which would alleviate much of the weakness in global trade and increased costs in global supply chains. While the U.S. and China both seem to indicate that progress is being made, we continue to believe than any deal will effectively only be a ‘photo op’, since they will be unable to settle longer-term issues regarding technology licencing and piracy, industrial subsidies and capital flows. China will probably agree to buy significantly more U.S. goods over the next few years, but anyone who looks closely at China’s 2025 ‘Belt and Road Initiative will understand that this more than just a bid to enhance regional connectivity and embrace a brighter future. It is a push for Chinese dominance in global affairs with a China-centric trading network. This plan will not be derailed by short-term trade disputes with the U.S. The longer term demands from the U.S. cannot be achieved under this plan, which is why we expect only ‘token’ concessions from the Chinese delegation and limited success on the really key issues which have caused the imbalances in U.S./China trade. Our investment management team is made up of engaged thought leaders. Get their latest commentary and stay informed of their frequent media interviews, all delivered to your inbox. J. Zechner Associates Inc. operates as Investment Fund Manager, Exempt Market Dealer and Portfolio Manager.